My interest in stringed instruments of the violin family began in the sixth grade, when I took up the cello and found myself more interested in the instrument itself than in playing it. 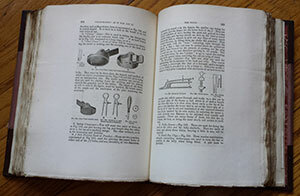 At that time I bought the first book—Violin Making As It Is and Was, by Edward Heron-Allen—of what was eventually to become an extensive library of violin books. Over thirty years ago that early interest blossomed as a second career when I left my job as a newspaper photographer and began working in the construction and repair of stringed instruments. My first formal training after several years on my own was at the Chicago firm of Bein & Fushi Rare Violins, Inc., a world-famous dealer of the finest antique and modern violin-family instruments. I worked in the shop there for over three years, learning repair and restoration techniques from some of the best people in the field, particularly Russell Wagner, an internationally respected cello restorer, and the innovative and talented John Becker, one of the most skilled violin restorers of our time. Thanks to my background in photography, for 15 years I also held the post of Bein & Fushi photographer, a job that took me all over the world to photograph literally thousands of the greatest masterpieces of violin making for the firm’s popular publications. Unexpectedly, this turned out to be one of the most valuable experiences I have had: from this exceptional opportunity I have been able to collect photos, drawings, measurements, and first-hand experience with a huge sample of the works of every one of the world’s greatest makers, both the prolific and the obscure, and have tailored my own models and style of violin making after the best instruments I have had the pleasure of handling. While finding repair and restoration to be interesting and invaluable training in tool skills, I was still most interested in making violins myself, and in 1988 moved to another shop in the same historic Chicago Fine Arts Building, the violin making workshop of William Harris Lee & Co. There I worked under Will Whedbee and Tetsuo Matsuda, two skilled and prolific contemporary American makers. Both were trained at the Cremona school. Will was responsible for the direction of the Lee shop, and in that capacity had developed a whole new approach to efficient and consistent making, very different from the skills I had learned at the Bein & Fushi shop, yet a good addition my previous experience there. In the Lee shop I benefited from the opportunity to work continuously on large numbers of instruments, honing important repetitive skills such as the fitting of bass bars, necksets, and setups to a level I could never have achieved in the slow and careful world of restoration. After four years, including working on 50 of my own instruments and hundreds of shop instruments, I left to open my own one-man workshop several blocks away. There, I devoted almost all of my bench time to the making of new instruments, almost exclusively violins, using the valuable knowledge of fine violins and fine players I acquired at Bein & Fushi and the production skills and techniques I learned from the Lee shop and Will Whedbee. In 2005, after several years on my own, I joined forces with musician and violin dealer Stefan Hersh to start a new shop, Darnton & Hersh Fine Violins; we were soon joined by Julian Hersh, also a musician and stringed instrument dealer. In the intervening years we have grown to become one of the primary shops in the US dealing in fine antique and modern instruments and bows, with important connections nationally and internationally. 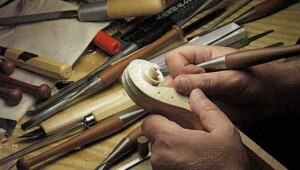 I now run the workshop there and also continue to build my own violins when time permits. 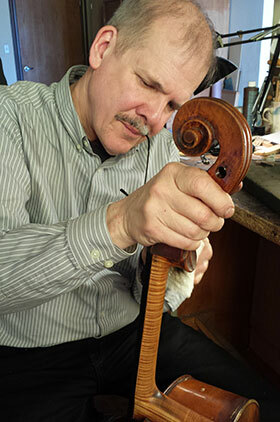 Throughout my years of involvement in the stringed instrument craft and business, I have valued being a member of the violin making community and have always had a passion for sharing my knowledge with others. For some years I wrote a column on violin-related topics for the Guild of American Luthiers journal, American Lutherie, and I presented at several of their conventions, including a lecture on setups which subsequently was published as a two-part article. Most of these articles are still available from the Guild on their website in their “Big Red Book” series. I have been intermittently working on a book about violin making and have published individual chapters online. Since 2006, I have been teaching every summer at the Southern California Violin Makers Workshop. Each year founder and organizer Jim Brown hosts a group of students of all ability levels and from all over the US as well as several other countries; teaching violin making at the SCVMW has become a high point of my year.